Traveling to Ladakh is fraught with challenges and one of the biggest challenge and threat to travelers visiting Ladakh is that of Acute Mountain Sickness (AMS). Acute Mountain Sickness occurs due to scarcity of oxygen at high altitude, and inability of our bodies to adjust to low oxygen content in air. Acute mountain sickness is defined as: In the setting of recent ascent to high altitude, headache with at least one of the following symptoms: nausea, vomiting, anorexia, fatigue or weakness, dizziness or lightheartedness and lack of sleep. While majority of travelers to Ladakh experience some or all of the symptoms of moderate AMS (headaches, nausea, vomiting, fatigue, loss of appetite and shortness of breath while walking), few get affected by severe AMS (shortness of breath at rest, inability to walk, decreased mental status and fluid buildup in lungs). Severe AMS can in some cases, lead to permanent brain damage or even death. Hence it is best to exercise caution while traveling to Ladakh and keep an eye on your health, as well as that of your co-travelers. This practical AMS Survival Guide aims to give you the information you can use and is tailored for those planning to visit Ladakh. Which is the best route to avoid AMS? Srinagar – Leh Highway is lower in altitude than Manali – Leh Highway, with the highest point being 13,479ft (4,108mtr), Fotu La pass. In comparison, Manali – Leh Highway’s highest point is 17,585ft (5,360mtr), Tanglang La pass. 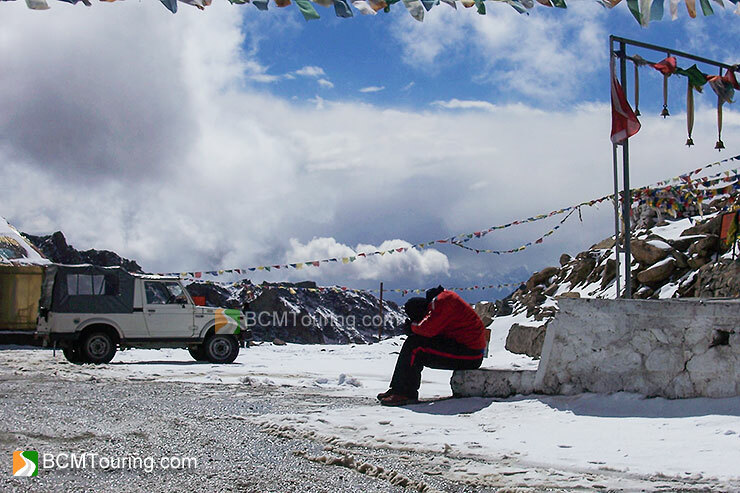 And for the 200km long stretch between Zingzing Bar and Rumtse Village, altitude never dips below 13,780ft (4,200mtr). Hence it is our recommendation that you take the Srinagar – Leh Highway, if you have the time and wish to avoid getting hit by severe AMS. You can also take the Shimla – Kaza (Spiti Valley) – Keylong route to Ladakh, which too will help you gain altitude gradually. However, please do not rush through it, since it will not only lessen your chances of gradually acclimatizing to high altitude, but you will also miss out on the wonderful sights en route. What if I have to take the Manali – Leh Highway while going to Leh? If you just have to do Manali route first or if that is the only route you are planning to cover, then it is best to avoid spending the night at Bharatpur, Sarchu or Pang. Instead you should stay at Keylong, Jispa or Darcha and then start in the wee hours of the morning for Leh. If you have to spend a night between Baralacha La and Tanglang La, then Sarchu is safer bet than Bharatpur and Pang. Whatever you do, do not attempt to cover Tso Moriri en route to Leh. Since it is even higher in altitude than Pang and will drastically increase your chances of getting hit by severe AMS as well as increase the time you spend at extremely high altitude. What if I am flying to Leh? If you are planning to take a flight to Leh, thenk make sure to spend the first couple of nights in Leh or at places like Alchi or Uleytokpo, which are comparatively lower in altitude than rest of Ladakh. Is there a particular pattern in which I should travel in Ladakh to avoid AMS? Once you arrive in Leh (either by land routes or by flight), you should still be cautious about your sleeping altitude and only gain it gradually by doing Nubra Valley first, followed by Pangong Tso and then Tso Moriri, Hanle etc.. This is due to the fact that even though you have to travel on the highest motorable road, Khardung La, to reach Nubra Valley, it is lower in altitude than Pangong Tso and Tso Moriri. In fact irrespective of your mode of transport and route, you should aim to spend at least first couple of nights in Leh, in order to acclimatize and unwind, before proceeding to any of the above destinations. If despite taking all the precautions, you still feel effects of AMS at Pangong Tso or Tso Moriri, then instead of spending the night there, you can return to Tangste (in case of Pangong) or Chumathang (in case of Tso Moriri) to sleep at a lower altitude and minimize the effect and danger of AMS. Normally descent of just 300-900 meters (1,000-3,000ft) is enough to make you feel better. Which medicines can I take to avoid AMS? Diamox: While Diamox can somewhat speedup acclimatization process, by making your body breathe faster and help increase overall oxygen intake, it isn’t a surefire way to avoid AMS and it will not help if you take it only after you start feeling the effects of AMS. It is better off as a preventive medicine. Current recommendations are 125 – 250 mgs twice daily, starting a day before ascent and continuing for a couple of days at the height or even for the entire duration of stay. If severe symptoms develop, Diamox will not be useful and in such cases, descent is the best way out. Diamox has various side effects, ranging from numbness and tingling in the fingers and toes, nausea, vomiting and diarrhea, drowsiness and confusion. It will also make your cold drinks taste flat and increase urination. So make sure to drink water regularly to keep yourself hydrated. You should consult with your family doctor, before taking Diamox, especially if you are on any medication. Also since Diamox is a sulfur drug, it cannot be taken by those who are allergic to sulfur drugs. Taking a test dose a few weeks before your trip to see whether you experience any severe side effects of Diamox is a good idea. Dexamethasone: 2-4 mg of Dexamethasone every 6 hours is also effective in preventing and treating AMS. The mechanisms of action of dexamethasone in relieving AMS symptoms are unknown. Its relative effectiveness compared to Diamox has not been established, but it likely is equivalent to Diamox. Dexamethasone should only be taken in consultation with your family doctor/physician. Disprin/Aspirin: Those who do not wish to take Diamox, blood thinners like Disprin, Aspirin etc. can not only help reduce some of the symptoms of AMS eg. headaches, but also help your blood carry more oxygen. Oxygen Cylinder: You can also carry portable oxygen cylinders, which are available at chemist shops and should provide you temporary relief, in case you or those traveling with you start to feel uneasy. What other precautions I should take? You should avoid spending too much time at high altitude passes. You should drink water at regular interval and water mixed with glucose or electrolytes to keep yourself hydrated and keep your energy levels up. You should avoid overexerting yourself and take frequent breaks while walking or climbing stairs. You should avoid overeating and eat light yet frequent meals. You should avoid smoking and drinking till you are fully acclimatized, since alcohol is known to cause dehydration. You should immediately approach hospital or an army base if you or a fellow traveler starts showing symptoms of severe AMS. You should follow trekker’s mantra of climbing high and sleeping low i.e. even though you might travel across high altitude passes during day, you should try and sleep at lower altitude places. And of course, travel to Ladakh with an open mind and an open plan, and avoid trying to stick to a plan/itinerary at the cost of your own health and wellbeing. Disclaimer: This article has been written by a traveler and shouldn’t be confused with medical advice. You should always consult a doctor before taking any medicines and read other opinions and articles on AMS eg. this one High Altitude: Acclimatization and Illnesses, to arm yourself with the knowledge that can help you and those traveling with you to Ladakh. A big thanks to Dr. Pushpinder for his valuable insights and suggestions. Good piece of information Yogesh.Majority of people do sightseeing in a hired cab driven by a local Ladakhi driver who is somewhat immune to AMS.Passenger must take care of AMS issue themselves and direct cab driver for sufficient breaks during journey which local Ladakhi driver may ignore sometimes. Thank you Narender. You are quite right, those who are visiting Ladakh, must keep constant attention on their health and proceed accordingly. I have gone through the wonderful article on AMS. I had covered the Manali Leh and Srinagar-Leh route. Twice I did Manali-Leh(first time in 1992 and again in 2004) and once Srinagar-Leh on motorbikes. I am of the considered view that you must follow the golden rule of ‘climb high, sleep low’ even while motorbiking. Since I had climbed a few peaks in Himalayas, the best way to get acclimatized on Manali-Leh route was to spend a considerable time of the day at Rohtang and then come down for a night halt at Manali. There is no harm in staying at Keylong the next day. But it would be quite appropriate if on the very next day, you move either to Patseo or Zing Zing Bar spend considerable time and come back to Darcha. This would enable your body to get acclimatized to the thin air. This would also afford an opportunity to check back the performance of your motorbike and the same can be adjusted as per requirements of high altitude. Ramesh, that is quite true. However people rarely have enough time to spend 3-4 days for Manali – Leh highway and in such a case, it is far easier and faster to just go via Srinagar route. it was very very useful for us when we travel Ladakh by road in 2012…. What medicine would be safe for tourists having sulpher allergy instead of Diamox ? As mentioned in the article, you can try Dexamethasone. However make sure to consult with your doctor first, since it can cause side effects. Nice article, I would also like to highlight the amount of tourist visiting these places who think of these places as another Manali and are totally ignorant about dangers like AMS, Frostbite , Sunstroke & landslide in these areas. How many times have we seen people spending long duration on Passes with children below the age of 5. To avoid AMS homeopathic medicine COCOA 3x can also be cosulted. Desi medicine is garlic. Keep garlic in your mouth and chew slowly to intake its juice. This is valuable experience.I do not know about the fact. Thanks.. I will take care myself on my Sunday trip. I am going to Ladakh this sunday.. Thanks once again. Thanks for the useful piece of information. I’m going to fly from Delhi to leh in 2nd week of September. However, I’ve not yet made my itinerary. Though I suffered with breathing problem while trekking to chandrashila last November, but am quite confident that if I take proper precautions then I would still make it. What would be your suggested itinerary if I have 8 days after reaching leh? Ashish, please start a thread in Ladakh and Zanskar section http://www.bcmtouring.com/forums/forums/ladakh-and-zanskar.24/ with what you wish to cover and your mode of transport in Ladakh (taxi, shared taxi or motorcycles) and we will help you out with the appropriate itinerary. This is very useful information you have shared. Thanks buddy. I m planning to go to Leh via Spiti valley. Our Itinerary upto Leh for sleeping points is : 1-Narkanda, 2-Kalpa, 3-Kaza, 4-Jispa, 5-Pang, 6-Leh, 7-Rest day. After reading your blog I have doubt over my stay at Jispa & Pang being on High altitudes. But as it will be long ride from Kaza to Sarchu, I think Jispa is better as Keylong is still higher than Jispa to be slept. Advise me please. Also, we are 2 people riding on motorcycles. It was indeed very helpful. We have planned a group ride next week to Leh/Ladakh with a few riders aged 50+ who have no exposure to HA. This information will be very helpful in planning a safe ride. Good piece of information Yogesh, will definitely help me next time I will visit Ladakh. Thanks a lot for the tips. I am planning to visit Ladakh mid August 2016 with my family – Me, My wife, my twin kids (3.5 years old), my sister and her husband. More than anything else I am not too sure how the kids will get along this journey (I have done few road trips with them – in plains). I need a bit of advice in this area. Please let me know your comments on this – more from the risk point of view. Wow, well explained everything. Will definitely recommend this to my friends who are planning a trip to ladakh. Very Good and informative article. Is AMS very serious in Ladakh for general traveler visiting Leh and Diskit via Srinagar ? Are there any cases of death or such incidents in Ladakh due to AMS?. Is it related to AGE?